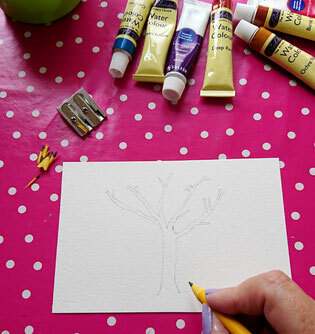 Art Therapy, have a go at Painting a Tree! 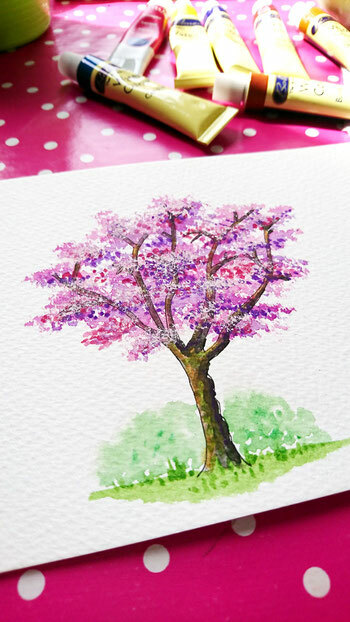 You Can Paint a Tree! I am so so busy! 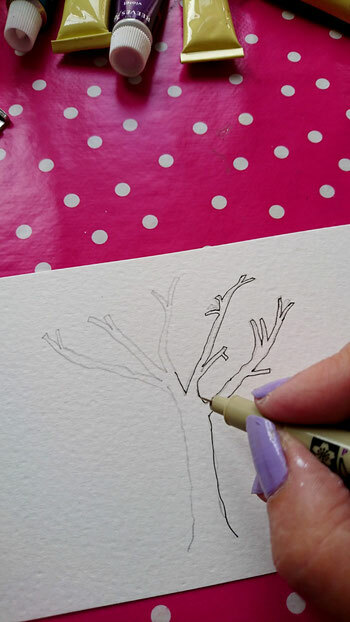 what with printing lots of wonderful gifts for all of you that are coming to The Handmade Fair in London, i paused for just a moment (Pause.......) and remembered that i had promised to show you how to paint a tree. I always keep my promises as you are all so important to me, so here we go!!! I use between 200 and 300 gsm art paper but you could practice on any paper. 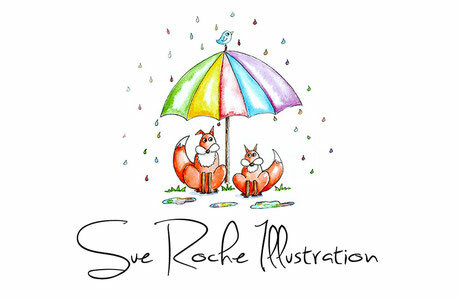 You will need two brushes a soft one and a thicker one for stippling. You could start with some cheap paints, they are really reasonable in the Works, or the Range. This is the Waterproof ink pen i use in size 005, available on Ebay or Amazon, or from your local art supplies. First sketch a tree, you can copy mine if you wish. I never get anything correct on first go so use your rubber until your happy. No shame in rubbing out. 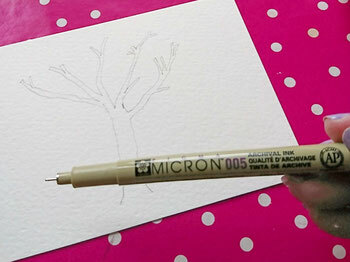 Now go over the pencil line in ink, do not worry if you mess up its fine and will give some character to your tree. Now Splodge some paint on one side of your tree, easy isn't it? Now dip your brush back into the water. And then smear the paint across your tree, it will look all smudgy but that's perfect. Let it dry for a few minutes otherwise it will start to look muddy when you apply more paint. Now add some green paint to the left of your tree and branches, and repeat the smudging in with just water. 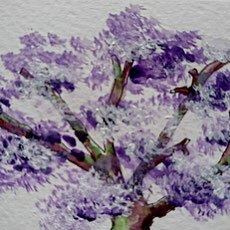 Grab some purple paint onto your brush and add a little water to it so that it's more flowy. 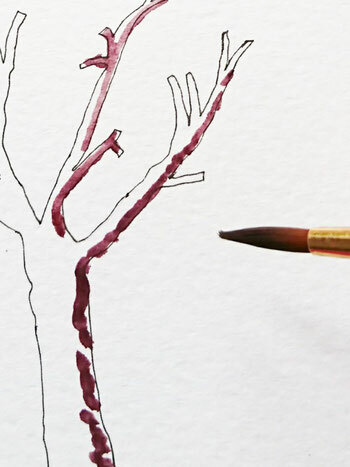 Dot paint across some of your branches so that they look like slightly like bunches of grapes. Get your stiff brush and dib it into the white paint and then stipple over the parts you have just painted making sure you leave some purple grinning through. 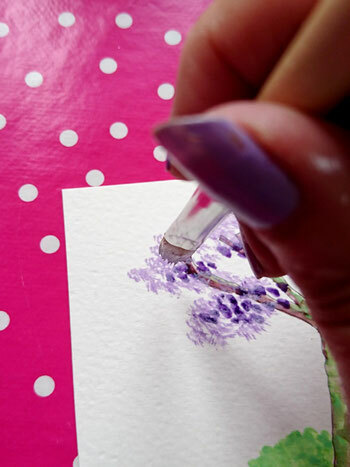 Keep your brush upright and just tap the bristles onto the paper. Stippling is great fun, go on get a little bit carried away. Now add some pink paint in the same way you applied the white,. if you want your tree to really stand out also add some red, in small amounts. Finnish up by blobbing green paint for trees and smudge water over them trying to leave some white gaps. The white parts are very very important.They really make your painting come to life. 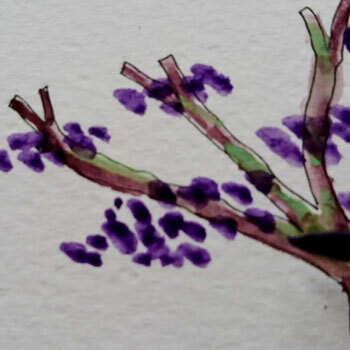 Congratulations you have painted a tree, i would love for you to send me your tree and i will share on my facebook page. Hope you have had fun, keep practising.